MYTHIC #4 Now Available In Trade Paperback! Well, it's finally arrived. 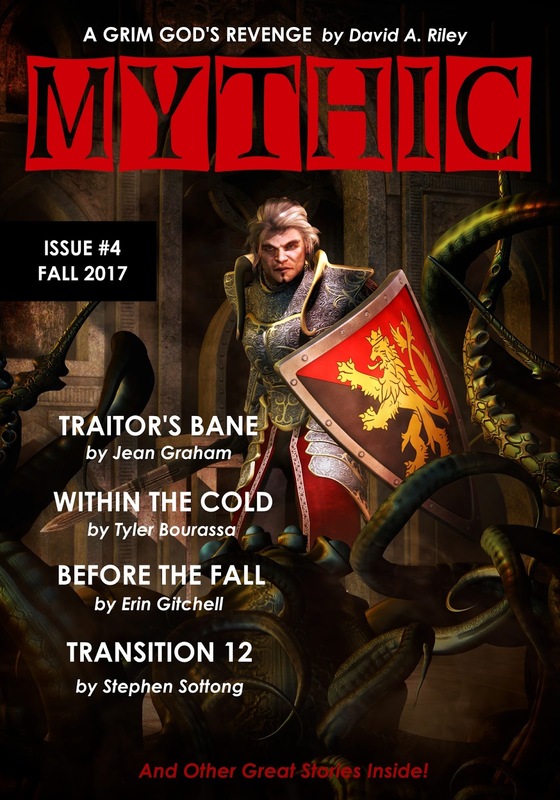 The print edition of MYTHIC #4 is now available for purchase. I want to apologize again for the delays that have come with this issue. Even now, I'm working to get contributor and subscribers their copies. Please be patient. You will all receive your magazines. Thank you so much for your interest in MYTHIC. I'm also working to prevent a repeat of what has happened here in the release of MYTHIC #5. I will be sharing a cover reveal very soon. You can purchase copies here or you can visit stores like Amazon where we also have a Kindle edition available. Hello everyone. Those of you paying attention to the goings-on here at MYTHIC may have noticed that issue #4 has been delayed. I wanted to give a bit of an update about that and also announce something new. 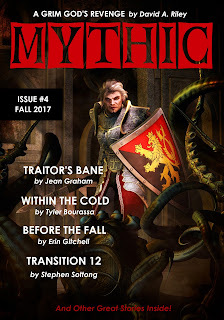 First, with MYTHIC #4's print edition, I want to assure the subscribers and other readers that you will receive you copies in due time. Production issues and other delays have pushed me off schedule. If you've been around since the beginning, you know that the emphasis for MYTHIC as been to produce a quality print magazine on a quarterly basis. I looked back at the old pulp magazines for initial inspiration. These days, though, there are a lot more magazines out there based on similar models. A proliferation of new markets actually, of which MYTHIC is just one. One difference though is been that those magazines have both print and ebook editions. Well guess what? Now, MYTHIC will have ebook editions available on all the major platforms. In fact, you would be able to purchase the Kindle editions right now. Issue #1, Issue #2, Issue #3 and Issue #4. For epub editions, you can go to Smashwords.com right now and other sites will be available over time. Individual ebook editions will allow more people to check out what we're doing in the pages of MYTHIC but my hope is that readers will still prefer to have our wonderful print editions. Subscriptions, at present, are only available for the print copies only. Thanks again to all of those who support or are interested in our magazine. We want more readers to find out what's going on. Share this. Get the word out. Become a subscriber. Help us to succeed in our mission of publishing quality science fiction and fantasy stories.